A woman is forced to question her own identity in this riveting and emotionally charged thriller by the blockbuster bestselling author of The Good Girl, Mary Kubica. 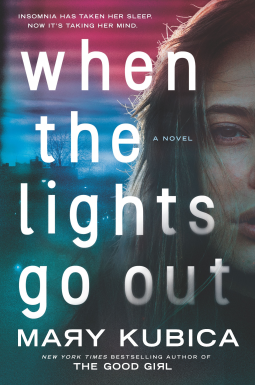 When the Lights Go Out by Mary Kubica is a very depressing yet intense novel. Inside, I followed a young woman’s journey through nightmares. She has been in the hospital at her mom’s side and won’t sleep until her mom gets better or passes away. The doctor tried to tell Jessie to get some sleep, but she won’t listen. I felt her pain and her tiredness. Her confusion and pain about finding her father and her mom’s cancer was horrifying. Jessie could not tell apart reality from nightmare. I could not tell the difference until the ending…that’s when all became clear. Grief, loss, and secrets are explored in this novel. I cried a lot when I read this story. Jessie did want her mom to die from cancer. She kept hoping she would get better. Then, there was the fact that Jessie never knew her own father. Mary Kubica never revealed that secret. But the man that should have been her father became one to her while her mom was passing away from her cancer. The death was slow…and when the last moment came, it sped by quickly. My heart broke. Overall, this was intriguing, dark, and heartbreaking.